I got some cool things last week! I figured I would post about them because I don’t have much else to post about. 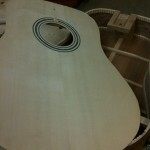 I got an Engleman Spruce and Western Red Ceder soundboard. Also two Black Walnut backs and sides. And thats not all! More to come probably later this week. So I started my first guitar today. 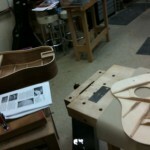 It’s a kit build from www.usguitarkits.com. The kit is like 75% finished already. 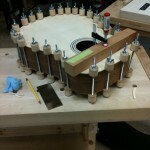 All you really have to do is shape the soundboard braces, cut the kerfing, glue on the soundboard and assemble the neck. 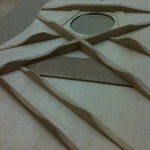 Today I got all the way through glueing the soundboard. 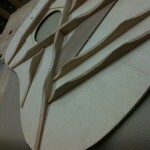 It’s a standard dreadnought guitar. 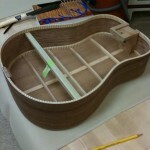 It has a spruce top and sapele back and sides. So far so good! 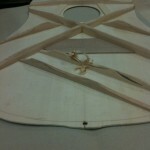 I’m enjoying the class so far and I really look forward to the knowledge that I get from it. Next step is to get a garage somehow so I have someplace to do this on my own!